Scroll down far enough on this page and you'll find an animation of a spinning dancer. Well, OK, she's not really dancing as such, she's more like holding a pose and being spun by magic. No matter what, though, she is rotating about her vertical axis. So, the question for you at this exact moment is simply this: Is she spinning to her right or her left? If you think this is a stupid question, that it's obvious she's turning the way you see her turning and that she isn't going to all of a sudden reverse direction, then you might want to keep reading, because some people, perhaps most people, can see her turning in either direction. The spinning dancer is a complicated version of the simple optical illusion called a Necker Cube, seen at right and copied from Wikipedia HERE. The Necker Cube provides no information at all about the perspective from which the box is to be viewed, so one can alternately see the square that emanates from the top right corner (or the other square, emanating from the lower left corner) as being at the front or the back of the cube. It takes little mental effort for most people to see one perspective and then the other, pretty much at will. But the spinning dancer is a somewhat different matter. You might be surprised to learn that you can get the dancer to spin the other way. Go stare at her some more, and see whether you can do it. I'll wait. The image of the spinning dancer is different from the Necker Cube in that, whereas the Necker Cube is perfectly symmetrical, the spinning dancer is not. For one thing, the lighting is a bit brighter at the lower left than the upper right. For another, at the bottom the moving shadow of her outstretched foot appears for longer at the left side than the right. For yet another, she is rising from and falling to, also as if by magic, the heel that's stationary. Now, a few of you who have read this far are saying, "Of course I can get her to spin either direction. It's as easy as the Necker Cube." You might want to stop reading now, but I'll bet most of you keep going. I'm betting you simply cannot get her to spin the other way no matter how long you stare, no matter how hard you try. She starts spinning one way no matter how you look at her, and she keeps spinning that way only, and it seems impossible she could ever spin the other way. Am I right? If I am, keep trying for as long as you can stand it to get her to spin the other direction. At least she's more pleasant to stare at than the Necker Cube. If you really give up, if you really can't get her to spin the other way, try what works for me about half the time: Glance at the lower left corner. It's interesting that other people have other triggers, apparently quite a few if you read up on this optical illusion. Did it work for you? If your experience with this illusion is interesting, please . My source for this animated gif is the October 9, 2007, edition of Australia's HERALD SUN, although if you discover the originator of this pleasant optical illusion, please so full credit can be given. For Google's list of other pages on this animated gif start HERE. For more optical illusions and links to even more, start at the Wikipedia page HERE. Best optical illusion. My favorite so far is on a page you'll get to in just a moment. First let me tell you that when you get there you'll see a square labeled A and a square labeled B. What you almost certainly won't see is that those two squares are the same shade of grey. No, they really are, and it's easy to prove. OK, go ahead and click here, then shake your head, then click the Back button. I don't know about you, but even though I know and do believe intellectually that they are the same shade, my brain refuses to see it. If you still don't believe me then this is not an optical illusion at all to you; it's just me being a liar or mistaken. 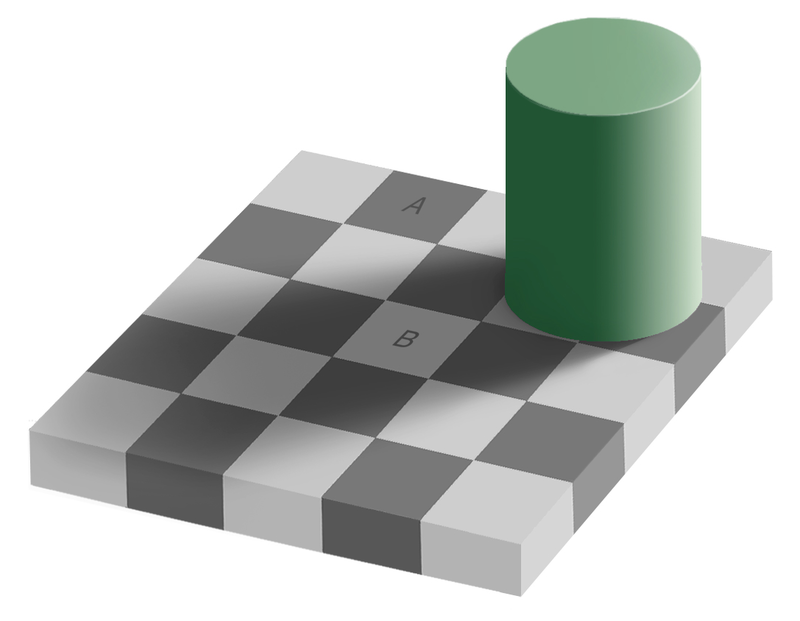 But if you do believe that the background of A and the background of B are identical then you almost certainly agree with me that this is your favorite optical illusion so far.